Star Wars Weekends offers a number of special character meet and greets that don’t usually occur outside of these dates, special shows, autograph sessions with actual Star Wars celebrities and event specific merchandise. Click the links above for additional information. 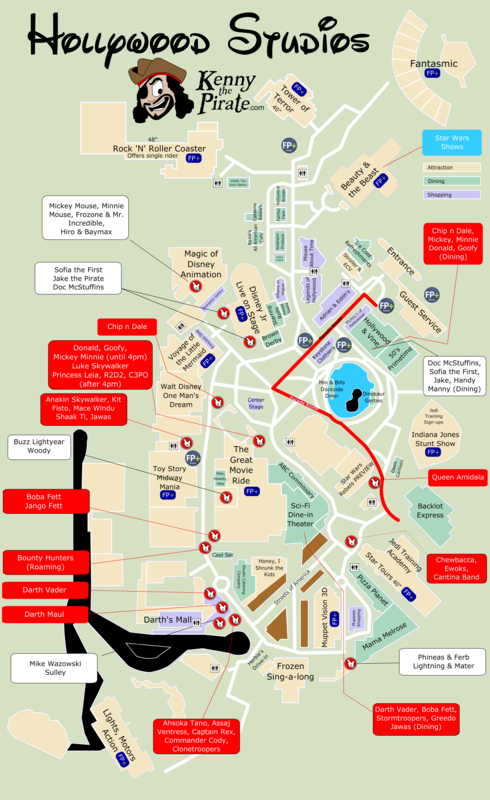 My Star Wars Weekends Map is included at the bottom of the post. All entertainment is included with regular park admission. James Arnold Taylor serves as the Star Wars Weekends host. Taylor is the voice of hundreds of Clone Wars animated characters, including Obi-Wan Kenobi. For the first time in Star Wars history, Walt Disney World is offering special Star Wars character dining opportunities at Hollywood and Vine for Dinner and Sci-Fi Dine-In Theater for breakfast. The Hollywood and Vine meal offers meet and greets with Mickey and the gang, while the Sci-Fi breakfast offers meet and greets with Star Wars villains with no wait. Click here for more details. Jedi Training Academy and Padawan Mind Challenge – additional spots are created for young padawans to participate and they may battle Darth Vader, Darth Maul or Asajj Ventress on stage in a friendly duel. Be sure to go straight there at rope drop in order to sign up. Sign ups for Jedi Training Academy occur at the Indiana Jones Stunt Spectacular during Star Wars Weekends! Here’s some basic guidelines for signups for Jedi Training Academy. Sign ups for Padawan Mind Challenge occur at ABC Sound Studios. Guidelines for the Padawan Mind Challenge are the same, so I would recommend attempting each on a different day. Spots for each of these fill very quickly. Legends of the Force Motorcade. The motorcade features that day’s celebrities, Disney characters in their best Star Wars attire and the 501st Legion marching by. The parade is VERY popular, so get a good spot at least an hour or more early. The majority of the parade only marches from the front of the park to the hat and the 501st parades all the way to Star Tours. Here’s how to watch the Star Wars Motorcade without losing your mind. Symphony in the Stars Fireworks. Symphony in the Stars fireworks will return for 2015! They should be visible from most of the park, but the best viewing is on Hollywood Boulevard in the area it meets Sunset Boulevard. The fireworks will cause an early closure to the Toy Story Midway Mania area! Celebrity Autographs. Fans line up many hours early to receive a return “Fastpass” (paper ticket) to come back at a specific time and meet an actual Star Wars celebrity. To get an autograph for a highly regarded celebrity, you may consider lining up as early as 5:00 am. (Some celebrities do not sign or meet guests). Darth’s Mall. Darth’s Mall, the giant Star Wars shopping area is being relocated to the former Backlot Tour exit. People line up hours early on the first day in order to purchase the most limited merchandise. You can enter easily in the late afternoon. Can I dress up for Star Wars Weekends? Yes, you are allowed to represent your favorite character at Star Wars Weekends provided that you don’t represent yourself as an official character. Disney World requests that you not wear any type of mask. Hundreds of guests dress up. It gets really hot and humid here in May and June, so be careful with those multi-layered costumes and heavy materials and drink lots of water! I purchased the Feel the Force Package in 2014 to test it out. I followed the directions exactly as they were provided on the Disney app and couldn’t have been more disappointed with my purchase! Here’s my review of the Feel the Force Parade portion (parade was at 11:30am in 2014). Here’s my full review of the Feel the Force Premium Package Fireworks for 2014. (Note: The hat has been removed, but I could still stand one foot away from the guests with snacks and get the same view). This should go on sale soon if you’d like to try it yourself. I prefer to purchase a $4 Mickey Premium Bar and stand watch the parade and fireworks in a better spot. See a new side of the greatest saga ever told with this one-of-a-kind tour, presented by Disney VIP Tour Services. By decree of the Jedi Council, a limited number of Guests can gain special access to several interstellar offerings atDisney’s Hollywood Studios. Prepare yourself for The Ultimate Day at Star Wars Weekends! Plus, after your guided experience comes to a close, you’ll have time to enjoy the park on your own before ending your day the Ultimate way with VIP viewing of the Summon the Force finale show and the Symphony in the Stars fireworks spectacular! The Ultimate Day at Star Wars Weekends is available for $399 per Guest (tax not included) and takes place every Friday, Saturday and Sunday—May 15 to June 14, 2015. In addition, all DVC Members, Annual Passholders and Disney Rewards Visa Cardholders will receive a 15% discount! For booking, please call (407) WDW-TOUR or (407) 939-8687. Advanced reservations are highly recommended as this special tour will fill up quickly. Guests under 18 years of age must have parent or guardian permission to call. Theme park admission is not included and is required. Entertainment and Character appearances are subject to change. I have heard that Disney is suspending Star Wars weekends for 2916. Have you heard this? Star Wars Weekends are sadly over. Announced it a few months back. I want to book for next year is the first weekend in June safe since no dates have been announced? Love your reviews! they’ve managed to help keep my sanity in the planning! Question: my son’s 11 going on 17 (too cool for Goofy & pals) but loves SW. I couldn’t get the SW breakfast but booked the SW dinner at H&V with Fantasmic, would you say it’s worth the cost? Yes, we really enjoyed both meals. You can read my reviews within this guide. In the area where there is more than one character (ex. Leia, Luke, C3PO, R2D2) do you have to pick one to stand in line for or will you stand in one line and get to go to each character? Thanks! You either need to guess well, or repeat the line over and over. Hey Kenny, we will be at SWW for the first time on May 16 with a 9:40am D-Tech Me reservation. As you have stated, lines to get into Darth’s Mall can be long. Do you know if the reservation will allow us to bypass the line? In other words, once we’re done with the res, can we stay in there to shop or is it a completely separate part of the mall for that experience, forcing us to go back out and get in line to shop? Yes, you can bypass with that reservation. If Emperor Palpatine (Ian McDiarmid) is not signing autographs….what exactly would he be doing? Is there any chance of meeting him if he’s not signing autographs? He’ll appear in a show or two and the parade. He isn’t doing official meets. Any thoughts on feel the force package coming back this year. We keep waiting and hoping. It’s our first trip and really want to jump on this. Hi Kenny, i reserved a Fantasmic lunch (@Mama’s) on May 31 with seating for the first Fantasmic. Will we be able to find a good spot for the fireworks after the show? Is the timing gonna be similar to Frozen Summer fireworks? Expect the experience to be the same as Frozen. Great views outside the park, but hard to hear the music. IF they do anything, there will be NO celebrities, only some characters. SWW doesn’t offer a dance party. Do you know if it’s okay to have a fake weapon with your costume? Thinking specifically of a Han Solo blaster, which looks like a gun. As long as it’s obviously fake, yes. How do I get FP+ please? Select your FP+ My guide to FP is at the top of the screen. 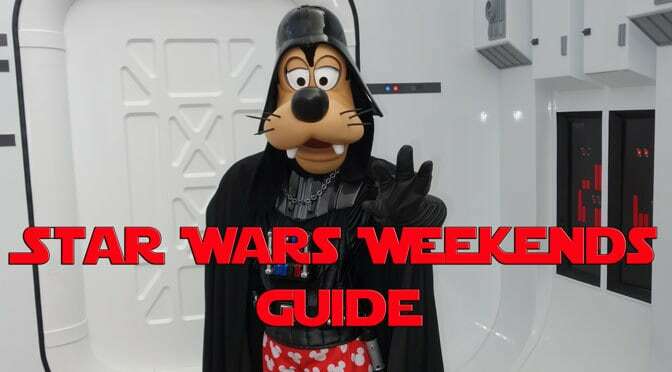 Am going to Disney in May this year,arriving on the 2nd,and leave on the 16th,have noticed that the Star Wars weekend starts the day before I leave(gutted I won’t be there for all of it) any hints/tips for what I can do with basically only one day for the Star Wars weekend? Meet lots of characters and catch a couple of shows using FP+. Hi Kenny! Love your blog, I’ve been coming here for the past 2 years to get info for our trips so thanks so much for everything you do! I was just wondering what your thoughts are on Star Wars Weekends with small kids? We’re not SW fans (gasp) and our little one has a sensory disorder- and he’s absolutely terrified of the SW characters (he even freaked out at the picture of Darth Goofy). We’re planning on bringing him to Disney for his 5th birthday (he’s dying to meet Handy Manny) but after reading about SWWeekend I’m considering visiting Epcot instead of HS, especially since I can’t take him to HollyWood & Vine! I hate to miss out on HS but if it’ll save a melt down I’m all for it! Any insight you could offer would be greatly appreciated! Hope you have a great weekend and thanks again! Why can’t you take him to Hollywood and Vine to meet him? Handy Manny will be there Breakfast and Lunch even during SWW. We have a vacation in June 2014. Can I book for the dining now!!!! Also what are some of the other major SW attractions. Thanks! Everything about SWW is in this guide. Be sure to click the links at the top. Kenny, any idea on how the children get picked for the parade? Is it a sign up somewhere specifically for the parade or random when they sign up for Mind Challenge or Jedi Training? All I heard was “it’s random.” I’m not really sure on that one. Read a great report over on the Dis… Someone said they were in line for Leia and R2 because they knew it was near the end of their set and Luke and 3PO would be out after them. They had already met Leia and R2 and let a few people go ahead of them as they got near the front of the line. Well before Leia and R2 finished, Luke and 3PO came out to join them for a few meet and greets. They got a picture with all 4 of them together. This was between 2 & 2:30. Very cool. Kenny- Question about Darth Goofy. Does he only met in the morning on SWW, or is he part of the afternoon rotation? Hmmm, let me look at that. Probably just an error on my part. Kenny will you be able to get info on the Jawa Trading? Someone posted on disboards that it has been confirmed that Jawa will be out and doing trading and posing for pictures. You’ll want to check out my Star Wars Characters page for more Jawa into as well. I will be there on May 18th and May 23rd. Fortunately we also have a couple of non SWW days at DHS, so we can devote our weekend time to Star Wars! I’ve booked both character meals as I have 5 kids ranging from almost 2 to almost 13 and our whole family love SW. We have only been once before and I know there’s lots of changes this year so I’m very very much looking forward to updates with any tips from you, the expert! I’ll be writing a review after the first day and posting live to my Facebook.